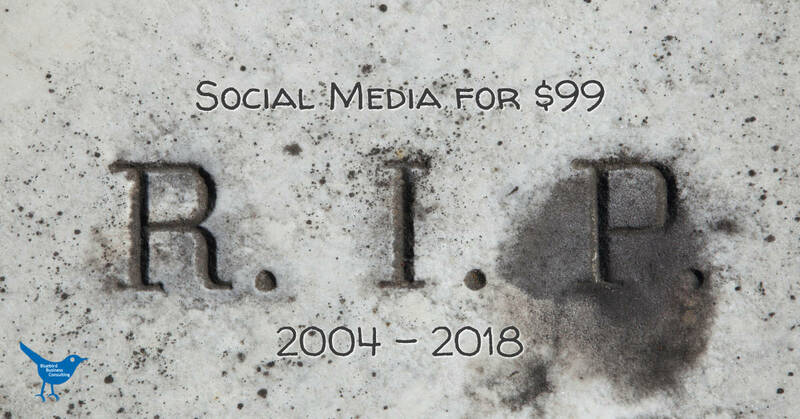 The end of the “Social Media for $99/month” package. Since I started offering outsourced Social Media management services I always have had to explain why I did not want to compete with low-cost providers or even those that offered Social Media services as a free add-on to their main service. Most of these low-cost packages include uploading a couple of posts per month to your Facebook page or even to several social channels at the same time. For under $100 per month. Considering that there is a cost for administering a contract, this leaves only about less than one hour for content creation per week. There is no room to respond to comments and messages, no room for analyzing the performance of the campaigns, strategy, video production and other things you need to do to provide value to your Social Media followers. The result are Facebook pages that include generic posts that are really only ads. Maybe a contest here or there or some generic post about an award or a copy of the newest print ad but that’s it. These pages usually have near zero engagement because people soon find out not to expect any value beyond finding the newest sale. Even before the 2018 algorithm change, these pages had very little organic reach. To have their content seen, pages like this had to spend a lot of money on ads and boosted posts. Because there is no real value for the business or the customers I have long called $100/month Social Media packages a scam. With Facebook’s announcement to place focus on community, these scams will soon be discovered. When the organic reach reaches zero, and the cost for Facebook ads go up, any business owner will see that this level of social media management has no benefit for the business. Sadly, some will give up on Social Media and will call it useless for their business. Others will realize that they have been scammed and will either learn how to manage a successful Social Media presence themselves or spend more money on hiring a professional that can do it for them effectively. Let me know if you want to talk about these options or a combination of both. The time for lazy Social Media management is over! All Social Media networks have realized that they can only grow if the users have a positive experience, spend time on their platform and react to ads. To become a real resource for our community, we have to learn to serve them better. We need to spend more time, listen better and provide a seamless experience. That brings me to the story that triggered this article. Last week we got new windows, and aside from all the work and distraction I now have a great example for my workshops. Often business owners fail to see how they could make a connection between the online and offline part of their business. Centra Windows gave me a great example of being active and involving their staff. Michele had been in contact with @CentraWindows before and noticed that I had forgotten to mention the company in my post. She added the tag to her comment so @CentraWindows would get a notification. Someone at Centra is monitoring the notifications and reacted very quickly. When the work was finished the foreman, and I did a walk through to confirm that everything was done. After I signed, he handed me a business card with the names of the installers and asked me to write a review on the company Facebook page so he and his colleagues would get a reward. The company used the opportunity to communicate with customers when they were mentioned. Social Media is not about how many pieces of content you post (but that’s important too) but how you communicate with your community and customers. Social media is a customer service tool. Many forget this! This example shows a great way to create “organic reach” for your Social Media presence. Effective Social Media in 2018 requires a lot of time and effort. The rewards for those that succeed in capturing the attention of their customers will increase.